Can anyone tell me would a Warford 3 speed out of a 1921 TT fit and would there be room in a 1923 runabout for it? Thanks for any help on this. Cast iron or aluminum case...both will fit, but have different installation requirements. Issues are driveshaft/torque tube length and support for the cast iron. 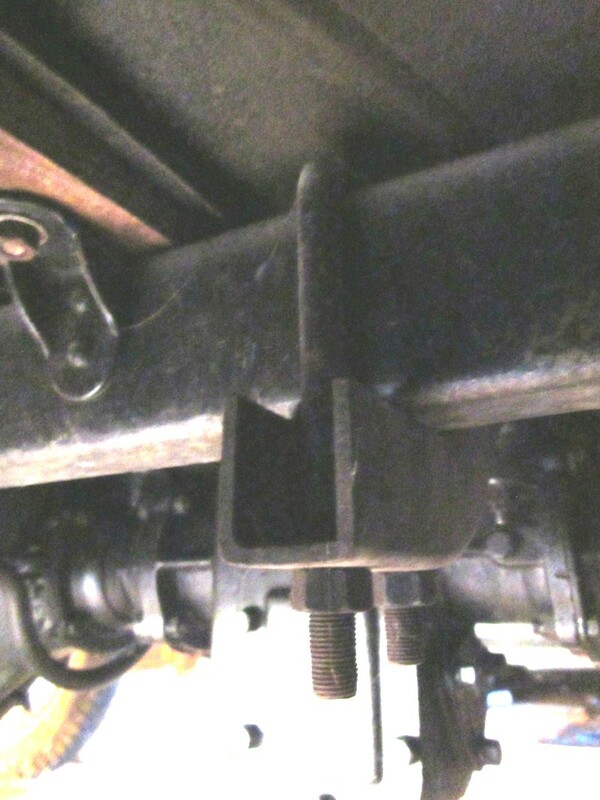 The support brace for the cast iron model would need to have spacers under it at the frame as the TT frame is deeper. You would have to have the torque tube, radius rods and drive shaft made to fit. Between the cast iron and aluminum cased models there there are different length requirements for for the drove line parts. Will it fit, yes is should as a number of people have used both. It has the Cast iron case thank you for the help. Just for the sake of being complete, most TT's that have a Warford, Muncie or the like have shortened drive shaft/tube and shortened radius rods. However, some (not as many) have an extended chassis instead. I'm not a big fan of lengthening the chassis, but it is another choice. A few have been installed without the front section and U-joint. They will bolt up to the T like the earlier aluminum case Warfords. That puts the shift lever farther forward but I think is an advantage to have the U-joint and extra mount under the Warford. Today lengthening the chassis is not the most practical but back then a longer wheelbase and therefore bed length was really useful for plumbers carrying pipe or lumber yards, some other specialty light and bulky loads as well. So far so good now I�m going to stick my neck out if you were to choose what would you pick, a Warford 3 speed, or the Ruckstell in a runabout? I have both and want to use one of them. Alan how fast are you comfortable driving? I really like how versatile the car becomes with a Warford. You have to really be zinging along to get in Warford overdrive though. I don't like to shift into that unless I'm going at least 40 mph. That's top speed for most folks in a stock T. Lugging along in overdrive is a sure fire way to break your crankshaft. If you never go fast (I have a speedster) then a Ruckstell is probably the better choice. A Muncie with a reverse is also a good choice for a TT. Ditch that runabout and get a TT ! Real men drive trucks ! I am running a cast iron Warford 3 speed in a '26 and use the front U-joint and the rear support. I did extend the width of the support and attached it below the frame with U bolts. There are other ways to do the same thing. Spacers have been mentioned, but placing under the frame is the best solution. Yes, I need to use lock washers. This was done 40 years ago and it still seems OK.
Burger in Spokane, I see that you may be a bit narrow minded as to the last post, you do not know how much a man I am as I am a new member and no one has any idea what or who I am or what I have , I was talking about my 1923 runabout not my other FORDS there are 3 of them and to answer you now one is a 1921 TT ( TRUCK ) the other FORD at this point is a Model T the model is not for you to know at this time as you seem to think you know it all. You�re so fast with your sharp tong you tell me what Model it is. I like the fact that with a Warford etc. in neutral, the car starts more easily in cold weather. The down side of it is you don't have the transmission brake in neutral. Make sure you have Rocky Mountain or some kind of auxiliary brakes. Sir, with all due respect, you blew Mr. Burgers post Waaaaaaaaaay out of proportion. He was only kidding. There is alot of that here, If you don't lighten up, your feelings will be hurt constantly. Kevin, my feelings are not even hurt it will take a lot more than a burger to do that with words, he opened his mouth so I retuned with mine if some one wants to fling some mud? I�m not afraid of getting dirty. Not to worry...we have BS artists on this forum. LOLOL....WOW...and you still don't understand that it was just a joke. You will note the use of emoticons to indicate humor in my post. We all noted your choice of words and lack of any in yours. lolololol....me take a chill pill???? You are the one who freaked out over a harmless joke. Whoa Kevin, Ease up on the throttle and welcome to the Forum. Back to your question, I would recommend the Warford but don't have any experience with the CI ones. I see your talking about a coupe so it would be perfect even on some hills. Now if you could swap with a TT guy or install it in your TT and get a alum one that would be the best. I see the old alum ones come around quite frequently and I've been Loving mine for many miles and years. Yes you could mount the CI on the back without the U-joint and spacer that allows for some flex but then you would have to swap the input shaft with an aluminum one as the CI is smaller then the hole in the 4th main by about an 1/8 inch approx. Even with a support at the rear and with frame flex that's still a lot of strain on the back of the motor if you leave out the Ujoint and spacer. Do a "mtfca; Warford" search, there have been a number of strings talking about Warfords in the past month some with links to earlier strings. You could make a sleeve. Simple shimming, I don't think will cut it. Alan -- One thing to keep in mind is that the original Warfords are difficult to shift smoothly. The straight-cut gears have no synchronizers, so you need to match the engine speed with the vehicle speed to get a good mesh for whatever gear you're shifting into. Maybe you have one in your TT and are practiced at it, but I never could get the hang of it when I had one. Since you live in hilly country you'd have little use for the overdrive gear anyway, so the Ruckstell might be the better choice. It would be like driving a Model A or any number of cars/trucks that didn't have synchronized transmissions. It's like driving with no clutch disengagement at all. There is so much drag on the T clutch that the output/input shaft never is disconnected. Some optional clutch, like a Watts helps. Typically all Warfords I have seen all have the gears chipped, worn or worse. One thing I have noticed with my Warford is that often by the time I have made a successful shift I have slowed down to where it is not right gear any more. I have not missed having a Warford or Ruckstell in the last T's I've built. One case I have has a mounting ear broken off and I attributed that to not having the extra U-joint and housing. I have a Muncie in my TT. When it's less than fully warmed up it's difficult to shift. Once it's warm I can shift it and never nick a gear at a stop or on the fly. It just takes a little practice.